With the country still on its heels from the deaths of Michael Brown and Eric Garner at the hands of white police officers, video has surfaced of a reportedly 12-year-old boy being punched by a New York City Police Department plainclothes officer as three uniformed cops attempt to arrest him, the New York Daily News reports. "He's 12!" 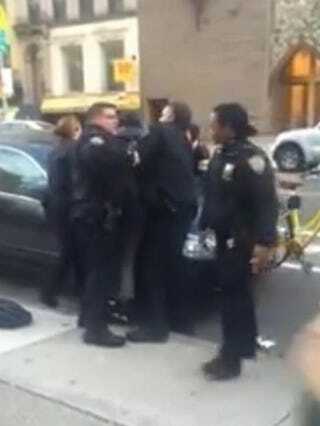 a woman can be heard yelling on the video, which was uploaded to YouTube on Dec. 17. "I can't believe you just did that. I can't believe he just did that after everything that's happened." According to the person who uploaded the video, the incident occurred after school. "This happened today on my way to the post office. The kids were 12. They had supposedly pushed one of their classmates down," the YouTube videographer wrote. "However, when the victim was asked, he said those weren't the guys. They were still taken away. 12. Years. Old." According to the Daily News, Internal Affairs is investigating the incident and the arrest, and police say that two young men, including the one struck, were arrested on charges of assaulting someone with a cane.